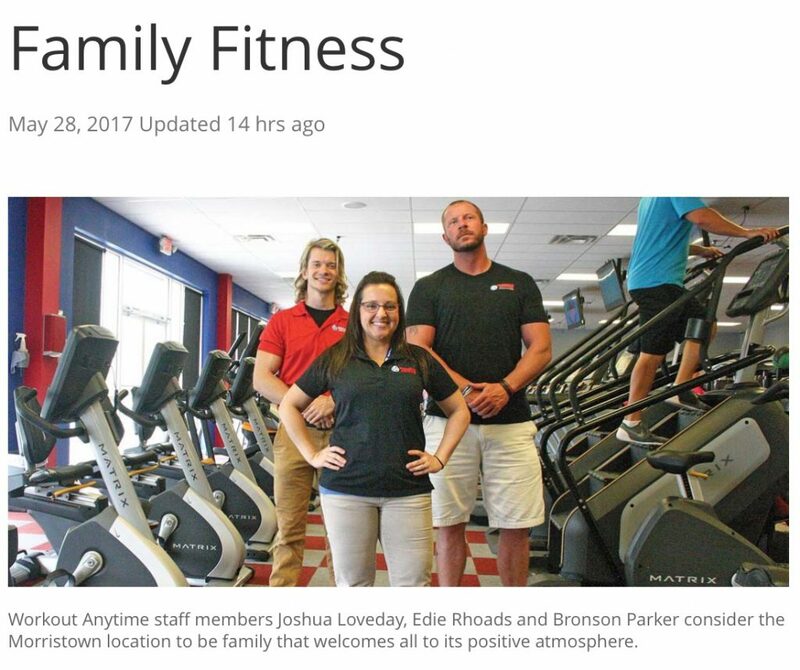 Edie Rhoads, manager of Workout Anytime in Morristown, said her facility is much more than a gym. Workout Anytime is, instead, a family and has been since opening in Morristown about two and a half years ago. It’s something assistant manager Joshua Loveday said he, Rhoads, the ownership and other staff members strive for. As a national organization, Workout Anytime has kick started various fitness movements and is at the forefront of many workout trends today such as the 24/7 access included with any level of membership and certain pieces of exclusive equipment. The company is also dedicated to giving back to the communities in which facilities are based. At the Morristown location, Rhoads said the Christian facility — a location-specific choice — strives to maintain a safe, clean and positive atmosphere and to be welcoming to anyone and everyone. Those audiences include those wanting to lose weight, to build strength and to improve health, and other reasons. Rhoads said she takes pride in knowing, no matter what the person is trying to accomplish, she and her staff members care and will do anything to help that person reach the goal, whether it’s reducing a high cholesterol level or losing a few pounds for the summer season. That relationship begins at enrollment with a tour and initial goal-setting meeting. It continues with follow-up meetings, day-to-day conversations and, sometimes, even prayer. “We interact with our members on such a different level. They are not just a number. We know their names. We know their family members. We know who is fighting a battle… We know all of these things,” Rhoads said. Of course, a workout is a part of the package as well. Following a meeting to set goals and a potential plan of attack, the facility grants its members access to a variety of equipment to make those goals a reality. Walking through the door, members and guests will find a section of cardio equipment — treadmills, stair climber, bicycles and a reACT training system, which is exclusive to Workout Anytime — intentionally placed by the door. Cardio must be done before strength training to prevent injury. Moving deeper into the gym, there are circuit systems designed to work certain muscles or muscle groups and, in the back, a free weight area designed to increase strength and balance. There are also cable systems and props such as Yoga mats. All equipment in addition to the showers and locker rooms are open to members 24/7; a key card allows access during unstaffed hours, no matter the level of membership. They can also access personal training and additional, group exercise classes for an additional cost. Loveday said they will also be sure goals are met. Memberships to Workout Anytime are $15 for Basic services and $25 for Premium services. Bills are paid monthly. As a Basic member, there is 24/7 access to the gym equipment and locker and shower facilities. At the Premium level, members gain the ability to bring a friend and make use of the tanning beds during staffed hours, make use of the hydro massage bed 24/7 and set up a monthly meeting with a trainer to track progress and set new goals to be met. In January, the club rolled out its newest membership plan for friends and family members, which is a Premium membership for two people at $35 per month. Enrollment fees vary but are typically $99 and there is a once-a-year maintenance fee of $29. A 12-month agreement is required when enrolling in the friends and family plan, but there are no contracts to sign for Basic and Premium members. Fees can be paid via automatic withdrawal or up-front per year. Rhoads said that’s it. It’s simple and straight forward because they don’t want their members to feel like a number or draft. They want them to feel cared for, appreciated and supported. It’s the uniqueness Rhoads said she and the club will strive to maintain for years to come. For more information, call 423-353-1003 or visit 2340 Sandstone Dr.